This is a rare recipe– quick, vegan, gluten free*, low calorie, budget friendly, made from mostly pantry staples and very importantly, it is delicious! Tweaked from a recipe found on the Ambitious Kitchen website, it offers protein in the form of chickpeas and peanut butter plus lots of gingery, garlicky Kung Pao flavor. Serve it over rice, quinoa or pasta. Make extra to reheat for a tasty lunch! This spicy entree is super quick, very tasty, and is gluten free and vegan. Make sauce: Combine all ingredients for sauce and whisk until smooth. Set aside. Preheat a large skillet over medium high heat and ad sesame oil. When oil is hot, add Brussels sprouts. Cook until they start to brown, stirring frequently. about five minutes. Add red onion and bell pepper, lower heat to medium low, and saute another five minutes. Add salt and pepper to taste and stir in chick peas. Add the sauce and stirring quickly, combine it thoroughly with the vegetables. Remove from heat and serve over rice. 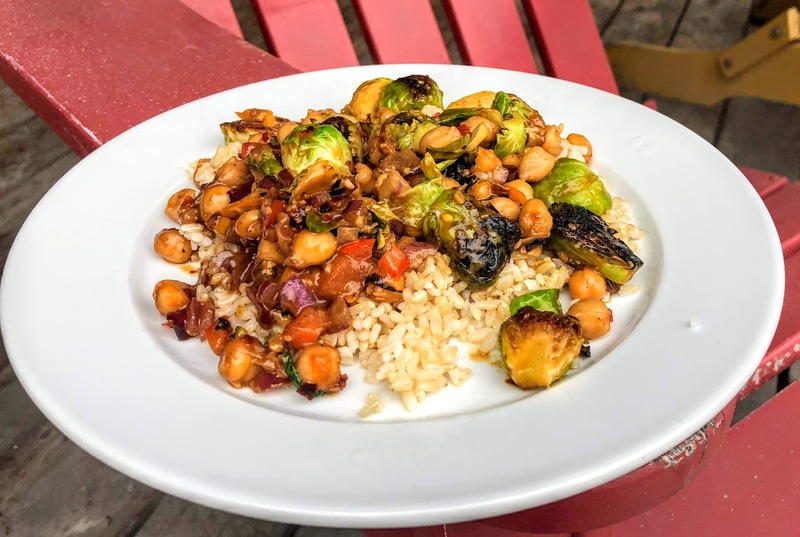 This entry was posted in entree, gluten free, vegan, vegetarian and tagged budget friendly, chick peas, entree, gluten free, quick, stir fry, vegan. Bookmark the permalink.